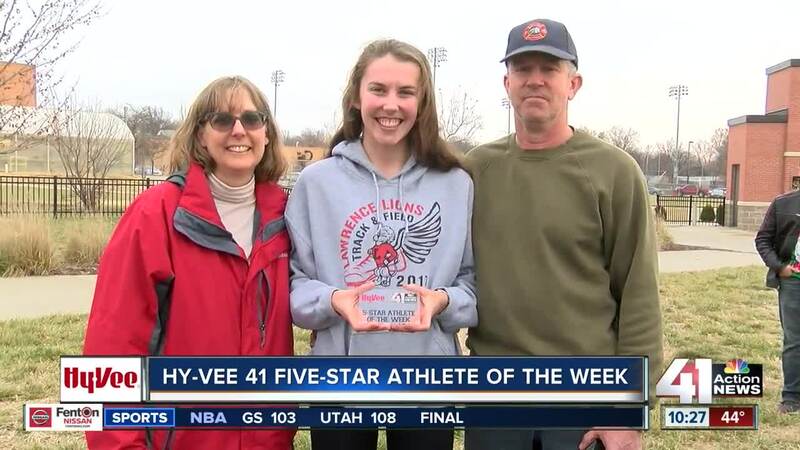 Lawrence senior and state track champion Evann Seratte is Hy-Vee Athlete of the Week. LAWRENCE, Kan. — Lawrence senior track standout Evann Seratte has had quite a track career in high school thus far. Seratte recently signed a national letter of intent (NLI) to run on scholarship at the University of Kansas next fall. That may have a lot to do with her success on the track. Last year, she won the Kansas Class 6A state championship in the individual 800-meter race (2:16.09). She also finished second in both the 400-meter and 4 x 400-meter relay race respectively. Her individual efforts also helped the Lawrence girls track team win the overall Kansas Class 6A state championship. Seratte says that much of her success comes from her teammates and coaches that are around her each and every day. "You know, I have that team around me. And, my coaches are great too," Seratte said. "I think the coaches, even the coaches I don't have here at LHS, all of the ones that are here at this school not only develop us as athletes. But, they also [teach] us how to be, you know, young adults and how to like live right. And, that's something that I'm really grateful that I got to have." Lawrence girls track head coach Jack Hood has coached there since 2007. He's been a coach for almost 23 years all together. In that time, he says that Seratte is one of the finest runners he's ever coached. "Lawrence High School doesn't have a formal hall of fame for athletes. You've got to be a CEO of a Fortune 500 company to get on our wall of fame inside. But, as coaches, we keep track of special kids. And, in the time I've been here, there's probably five girls that I would consider to be the absolute best middle distance runners that we've had. She's certainly in those five," Hood said. Even teammates that run alongside Seratte had high praises for the type of runner that she is on the track and the great teammate she is off the track. "Having her mentality of always wanting to win and always competing definitely just helps all of us as a team for sure," Lawrence senior girls track runner Hannah Stewart said. Stewart has run alongside side Seratte the past three seasons, including during last year's state championship meet. Stewart finished the Kansas Class 6A, 800-meter championship race in third. "It was special. Yes, it was for sure special especially with Evann right by my side. I saw her finish right before me," Stewart said. "It was definitely a very very special moment cause right up to that point, we knew that we were going to win state because that was the turning point in the meet. So, it was definitely special." Seratte is preparing for her final season as a high school athlete. The track season begins as part of the spring sports block in February. She hopes to duplicate her state championship performance this year. As for the continuation of her career as a freshman at Kansas, she's certainly excited for a new opportunity. "It's definitely a big deal for me and one that I'm super excited about," Seratte said. "KU feels like home just like LHS does. I'm super excited to join coach [Stanley] Redwine's progam and contribute and earn points for the team."